Offering gift cards on an online store is a great marketing solution that helps in increasing customer engagement and promoting an ecommerce brand. Allowing online shoppers to buy and use gift cards and certificates will certainly generate extra profits, and particularly during the holiday season. 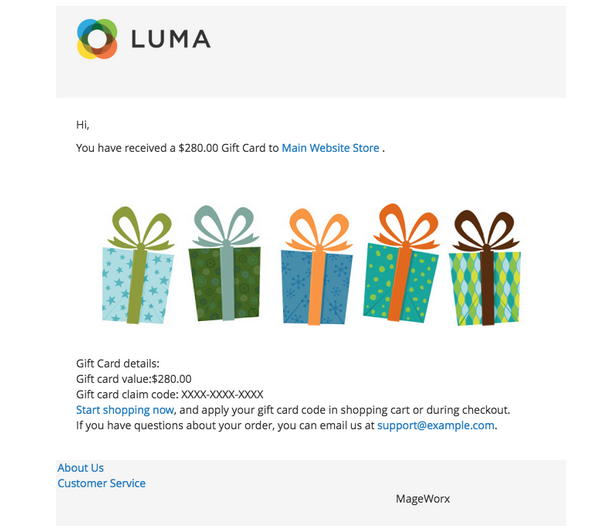 With the help of the MageWorx Gift Cards Extension, you can make the gift-giving process more comfortable by introducing the ability to purchase gift cards right on your ecommerce website. The extension supports physical and online gift cards types (we will describe them below), provides flexible pricing schemes & values, and offers a full backend control. By providing a wide choice of gift cards and pricing options, you can create an optimised and user-friendly gift-giving process on your Magento store. 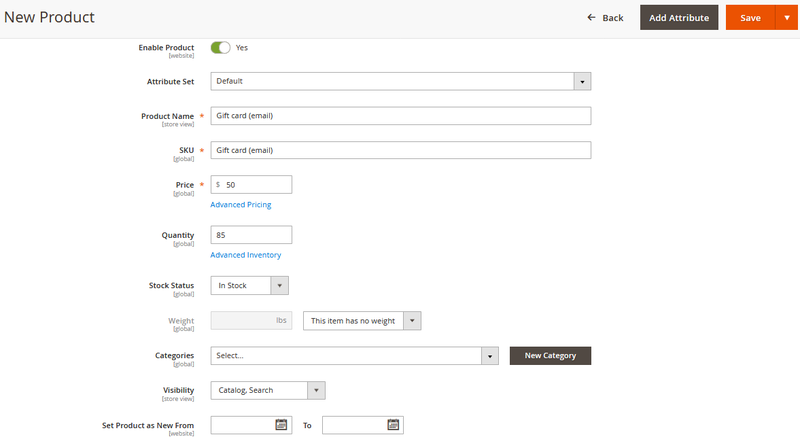 The whole section of this post is dedicated to the admin interface of the module and sheds light on Magento 2 gift card configuration, but let’s have a look at the tool’s features first. The MageWorx Gift Cards extension not only simplifies the process of gift card creation but makes it more personal. Besides, it offers a convenient backend interface, so you do not have to deal with a complex gift card management. 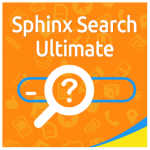 The extension enables admin users to generate an unlimited amount of gift codes quickly, as well as to create gift codes in bulk. Then they can use these codes in email promotions, social media, and any advertising and marketing campaigns. As for the gift card types mentioned above, you can offer both virtual and physical gift certificates, choosing between such options as email, print-at-home, and sent by post. In case of the first type, a code appears in the recipient’s inbox within minutes at the specified time. A print-at-home type is an option for those customers who want to deliver a hard copy of their gift certificates in person. Print-at-home cards require more time to be presented, but not as long as sending them by traditional mail. It is also necessary to say a few words about pricing. With Gift Cards for Magento 2, you provide your customers with very flexible conditions, so that they can choose between gift cards with fixed or variable values (fixed price, drop-down with a selection of predefined prices, or price range set by the store admin). With the extension, now it is possible to assign your gift card codes to different store views. In this way, customers will see gift card prices in their local currency. Moreover, you can set your gift codes to be available for selected customer groups. The MageWorx Gift Cards extension also brings the possibility to set gift card expiration period. This function provides more motivation for customers to make purchases on your store while a gift code still can be activated. To even more incentivise customers, you can send expiration alerts by email to them notifying about the code validity period. Gift Cards extension gives you full control over gift cards functionality in the backend. Admins can set card values, modify card status, change card balance, check statistics on every card usage, and much more. Both registered customers and guests can use gift cards on an online store. To redeem the dollar value amount of a gift card, a store visitor has to enter the unique code. The procedure is possible in a separate block of the shopping cart page or at the last checkout step. Besides, frontend users can quickly check balance and expiration date of their cards. Furthermore, it is allowed to spend the gift card balance over multiple transactions! Sounds very promising, so let’s look at the extension’s backend and frontend functionality. To view and manage your gift cards list, navigate to Marketing → MageWorx Gift Cards → Gift Cards List in the Magento Admin. As you can see, the grid provides all the necessary information about each card and offers the most required options. 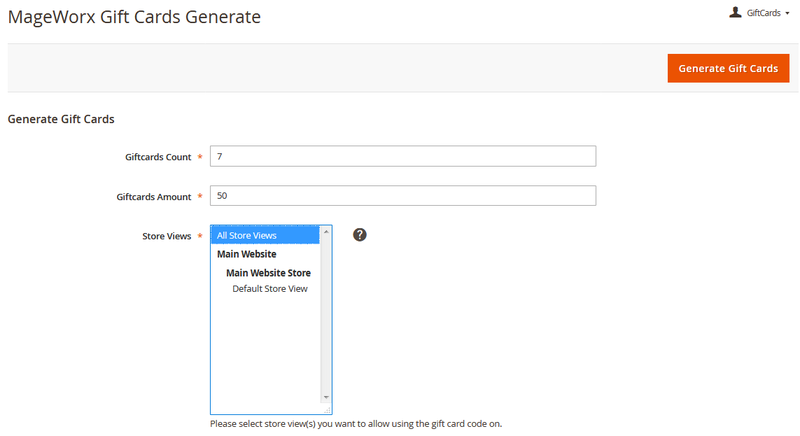 Let’s see further Magento gift card functionality exploring how new gift card settings look in the backend. While creating a new gift card, you should specify data for two sections: Gift Card Info and Recipient Info. Gift Card Info contains the following options: Gift Card Code, Gift Card Type (Email, Print, or Offline), Initial Value, Current Balance, Store Views (select store views where gift card code can be used). 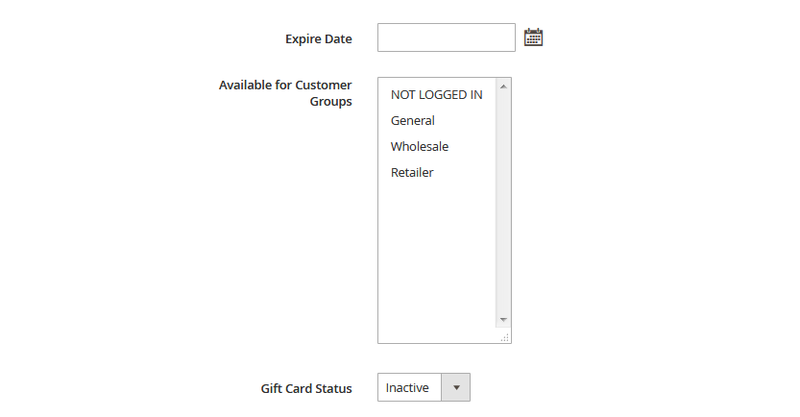 Other settings in the Gift Card Info section are: Expire Date (set a gift code validity), Available for Customer Groups (select which customer groups can apply a gift code), and Gift Card Status (Active, Inactive, or Used). As for Recipient Info, the options are: To Name (name of the recipient), To Email (email address of the recipient), From Name (sender’s name), and Mail Message (custom message sent with a gift card). It is also necessary to mention that each gift card has a tab with statistics. You can check the stats of your every card by selecting Statistics in the Actions menu of the gift card grid. The following information is available in the appropriate grid: Order #, Used Amount, Create Date, Update Date. As mentioned before, the module allows generating gift cards in bulk. To do this, go to Marketing → MageWorx Gift Cards → Gift Cards Generate from the admin menu. In the Gift Cards Generate configuration, you should specify Giftcards Count (the number of cards to be created) and Giftcards Amount (a card’s initial balance), and select store views. Here you also select Giftcards Type (Email, Print, or Offline), Expire Date, Customer Groups, and Giftcards status (Active, Inactive, or Used). 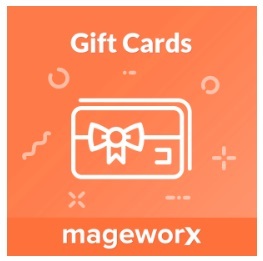 General settings of the MageWorx Gift Cards extension are available under Stores → Settings → Configuration → MAGEWORX → Gift Cards. They are divided between Gift Cards Defaults and Gift Cards Email Options. 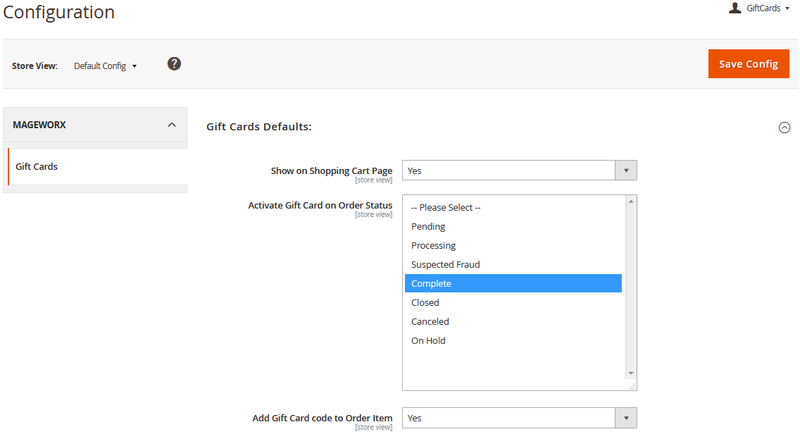 In Gift Card Defaults, you can enable or disable showing cards on the cart page, select how gift card should be activated on Order Status, and add gift card codes to Order Item. 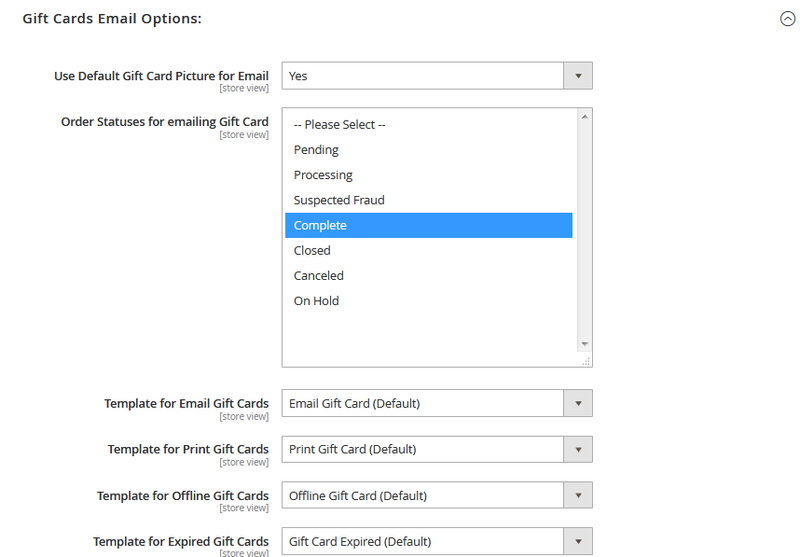 As for email options, here you decide whether to use a default gift card picture for emails, choose order statuses for emailing gift cards, and specify templates for all four gift card types, as well as expired cards. 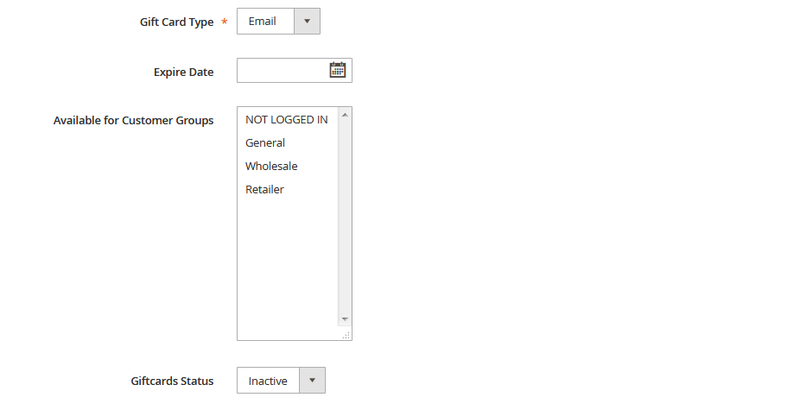 In this section, you also configure the options for expiration email notifications. 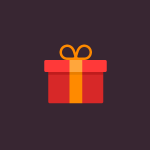 As for a gift card as a product in the backend, it has the same parameters as other goods on a Magento website, as well as some unique options, such as Giftcards Type in the Gift Card Information tab. Depending on the general configuration settings of the extension in the backend, your website visitors will see an additional block in their shopping cart, where they can enter their gift code, check its status, and activate it. When purchasing a gift card on your storefront, customers can specify their name, a name of a recipient, and his or her email address, and leave a personal message before adding a gift card to their cart. 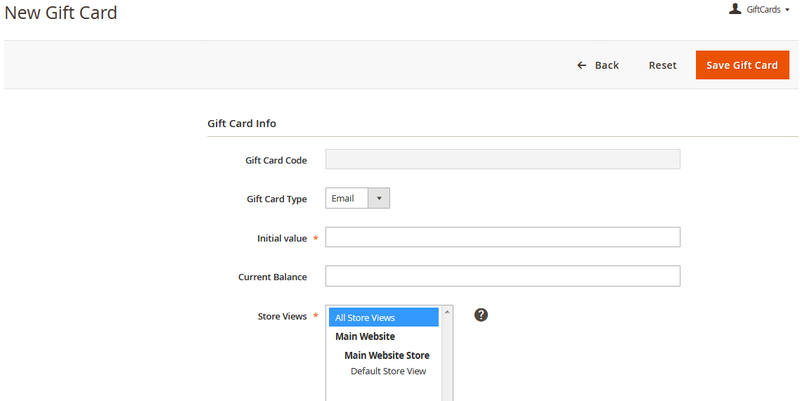 MageWorx is constantly updating Gift Cards extension for Magento 2 with new features. 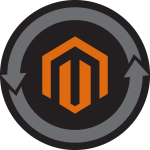 Now, the appropriate Magento 1 module offers a more robust gift-giving functionality, but soon the M2 plugin will have all the same characteristics. 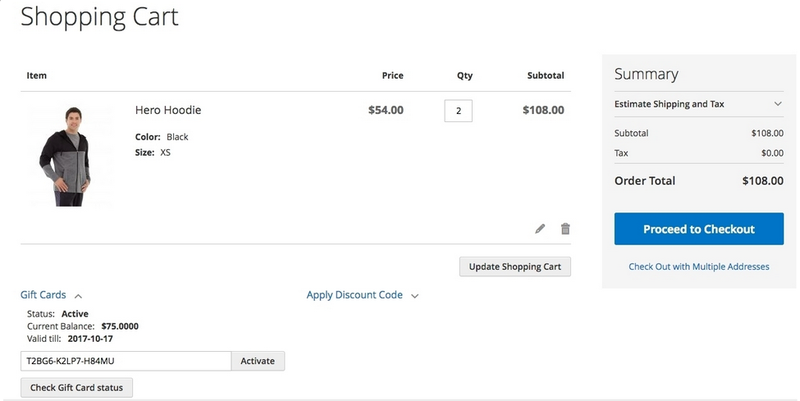 As for the prices, Gift Cards for Magento 2 costs $149, while for the Magento 1 extension MageWorx charges $119. Free lifetime updates and fixes are guaranteed in both cases. Moreover, if you are already using the M1 module, you may get a 50% off for an upgrade to its M2 version.